Three San Mateo County, California Sheriff’s Department officers, Michael Del Carlo, George Ismael and Juan Lopez, have been arrested on suspicion of smuggling drugs, cellphones and other contraband to a gang member inside a detention facility. 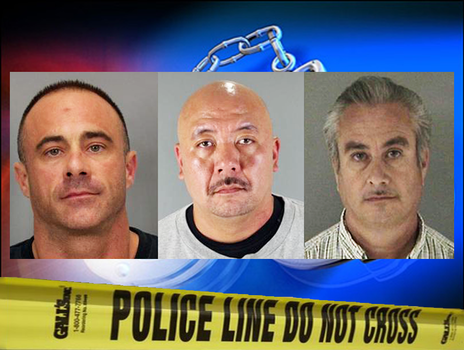 Lopez is a deputy, Del Carlo and Ismael are correctional officers at the Maguire Correctional Facility in Redwood City. All of them have been charged with bringing an unauthorized communication device into the jail and conspiracy to obstruct justice. Lopez has been a sheriff’s deputy in San Mateo County for 26 years. Earlier this year, he challenged his boss, Greg Munks, running for the post of Sheriff. Del Carlo has worked for the county for 19 years and Ismael has 15 years of experience as a law enforcement officer. “The Sheriff’s Office has hundreds of people who go to that jail. Any time you have a breach of security, such as bringing in contraband, that taints everything,” said Steve Wagstaffe, San Mateo County District Attorney. Del Carlo, Ismael and Lopez were also charged with gang enhancements, due to the fact that the primary beneficiary of the smuggling was a validated street gang member. He, in turn, shared the contraband with gang cohorts. According to the authorities, the officers received cash in exchange for the smuggled items. Ismael was also charged with conspiracy to bring controlled substances to the jail for allegedly smuggling Oxycodone to the unnamed gang member. Lopez was released, after posting $100,000 bail. Del Carlo has also bailed out. Ismael’s bail was briefly in jeopardy, when the prosecutors voiced their concern that he might be using illicit money. Ismael was subsequently bailed out by his wife. The charges against Lopez and Del Carlo carry penalties of up to five years in prison, while Ismael is facing up to six years behind bars. Del Carlo, Ismael and Lopez have been placed on paid administrative leave, courtesy of the American taxpayers.